«Christ's Church has to be a Church of Easter —that is to say, a Church that is born of Easter and exists to be a sign and instrument of Easter in the world. In other words, the Easter Christ remains and lives, in the Easter Church. 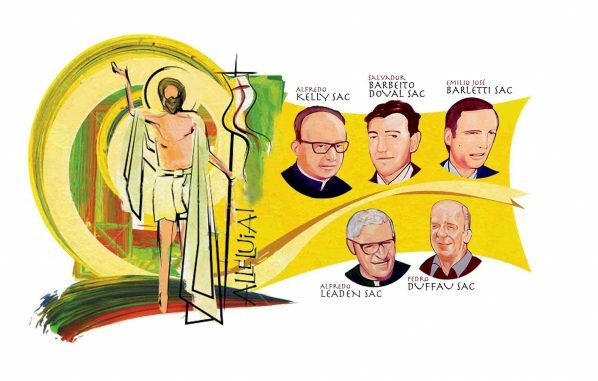 One cannot be part of this Church without being faithful to his manner of passing from death to life, without a sincere movement of conversion and of fidelity to the Lord» (San Salvador, Easter Sunday, April 10, 1977). These words of Blessed Oscar Romero, Martyr of Justice of our time, like our Argentinean confreres assassinated on 4 July 1976, are in harmony with the spiritual principle of kenosis that our holy Founder practiced and lived: “In fact, the entire process of spiritual growth is based and modelled on the paschal mystery, in which the old man is crucified with Christ and the new man comes into light with the resurrection. The result of these redeeming experiences is transformation into Christ” (Ratio Institutionis SAC, n. 140). This is the only and authentic way to make the life of Jesus the fundamental rule of our life, as our Founder, St. Vincent Pallotti has shown us, and as reminded by the XXI General Assembly of our Society. Wish you the Peace and Joy of the Risen Lord. May you experience the power of his Resurrection.